This is a critical issue and has a lot more implications than we apply it to. I take this internally and if we can expand on understanding the wisdom of Qurâ€™aan that Allah has communicated, it will threaten the fat Muslim clergy establishment. It is coming though. It is human nature or human fitra for one to be free, that's how God has made it. Islam, peacemaking, creating a world of harmony hinges on free will. Prophet Muhammad shook the idea and removed the conflicts by bringing diverse people together from a point of view of "my own god vs. your own god" to "our common god". Now Muslims have created, "my own tradition (sunni, Shia, Ahmadiyya, and wahhabi) to become a God of theirs. Javed, you ask why this issue is brought up again and again... look at the idiot guardians of Islam issuing idiotic fatwaâ€™s against each other. Sunnis claiming shias are no Muslim and vice-versa. We have to come to a common Islam, without losing our uniqueness. I take this further (Muslims are not ready for this) - in an evening party gatherings, I would not want any one even to remind the other to join up for Salat (namaz), it is individuals responsibility. If you want to pray go do it, it is your duty and you are the one to answer God, not me or anyone else. Who knows what she or he is going through? Social compulsions and embarrassments about asking are you fasting.. will fade away in the next two generations giving true value to no compulsion in religion. If Muslims can understand that, there is no compulsion in Islam, they would have understood Islam. when people get this, the establishment gets threatened, as if Islam is taken away from them, if Islam is not an internal idea of submission to god and external idea of acts, then they would lose it. I have to put some research work together on this, Insha Allah, one of these days. I know you will not do it, as you are afraid of losing your support from the likes of guardians of establishment. Javed, let's have the freedom to express the truth of creating a world of peace, submission to peace of humanity; God's will. It is not just you; it is the same story with the Christians, Hindus, Jews, Buddhists and others. Hold on to status quo or what is dished out to us, we fear them and not the Creator who wants us to get along and accept and respect each one of his creation. May we learn about all religions and the beauty they offer to create a peaceful living. Mazhab nahin sikhata aapas may bair rakhna. Iftekhar is on the right track, this non-sense about Abrogation of one verse against the other must be summarily discarded. Just because the Imams of yester years did not comprehend the wholeness of Qurâ€™aan, which is a beautiful document for co-existence of humanity, they took exceptions and start abrogating one or the other. With all due respect to those great imams, they understood the Qurâ€™aan that worked for them, their understanding does not work for us living in free societies where there is no compulsion, a real Qurâ€™anic way of life. We need to develop our own understanding and I know it frightens many; the change is coming. At least the American Muslim kids will not take some of the crap developed and thrown on Muslims as if it were Islamic. What is meaning of 2:256 "NO COMPULSION IN RELIGION." Abrogated: The passage was overridden by subsequent Quranic verses (such as 9:73: "O Prophet! Struggle against the unbelievers (Jews & Christians) and hypocrites (Jews & Christians) and be harsh with them"). Limited in time and place: It applied uniquely to Jews (only) in Medina in the seventh century. Present day Jews, Christians, Hindus and Buddhists have no choice but to read the Quran and covert. They must convert to Islam for salvation. Excludes some non-Muslims: Apostates, women, children, prisoners of war, and others can indeed be compelled. (This is the standard interpretation that has applied in most times and places). There is massive disagreement among the various school of thoughts among Muslim scholars, ulemas and maulanas: The debate over the no-compulsion verse has several important implications. Ibn-e-Arabi says (12the century scholar) 200 verses have been abrogated and Shah Waliullah (18th Century scholar) says only 5 verses. There is total confusion and chaos among present day "Hafiz-e- Qurans." This leaves more confusion in the minds of modern day Muslim youth of internet generation. First, it shows that Islam - like all religions - is whatever believers make of it. The choices for Muslims range from Taliban-style repression to Balkan-style liberality. There are few limits; and there is no "right" or "wrong" interpretation. Muslims in USA and Europe have a clean slate to resolve what "no compulsion" means in the 21st century We have yet to come up with a good "translation" of our Holy Quran that will take the global village concept into consideration addressing the global challenges for humanity. I canâ€™t understand why you keep on discussing the issue of â€œcompulsionâ€ in Islam. Do you find anywhere in the world Muslims forcing others to accept Islam? If you have a project or you are helping any organization in this regard better tell them the real problems of the world, most of which are related to irreligion rather than religion, and illuminate them abut how these problems can be tackled by following the socioeconomic system of Islam. Both you and I think globally. But there is a clear difference. I study and analyse the modern developments in the light of Qurâ€™an and want to change the world in accordance with Fundamental Rights, duties and Prohibitions enshrined in the Book. On the other hand you want to reinterpret certain Quranic verses to make them suit the demands of the current world order, which is largely based on un-Islamic principles. Religion relates to oneâ€™s internal beliefs and personal actions; system also includes the external conditions including the law and environment. Islam is not a religion; it is System that does not only want the people to have a right belief system and personal righteousness but also establishes a system that protects people and helps them attain their rightful goals without fear. We need good interpretation and translation of Quranic verses in English because there is a great need. This is the reality in America, UK, India & Europe. You have said: On the other hand you want to reinterpret certain Quranic verses to make them suit the demands of the current world order, which is largely based on un-Islamic principles. My answer: Almost all the Muslims who have settled in West and also in the Islamic world say, "There is more Islam in Western countries with the exception of "sexism and Banking system." Your writings on both this subject also seconds this facts. But in all reality....I have lived in Pakistan and also visited almost all the Islamic countries. I find lots of Muslims but no Islam. This is said by many Muslims...I am merely repeating what has already been said before. The Arab world treats Indian-Pakistani Muslims as third class citizens. There are numerous reports of abuse of power by the Arabs. There is so much hypocrisy and see what the Quran says, "The arabs of the desert are worst in hypocrisy and unbelief and most suited to be ignorant of the message that Allah has send to His messenger. " 9:97 and in 9:101 the hypocrisy gets very obstinate and the punishment gets more severe. JAVED SAHEB...IT IS FOR THIS REASON WE NEED TO RE-INTERPRET THE QURANIC VERSES TO REVERSE THE PATH THAT MUSLIMS ARE FOLLOWING......IT IS SELF - DESTRUCTIVE AND ARROGANT TO THE CORE. The way the Quran is explained to the Muslim world is based in the mind-set of 6th century Arabian culture of "jahaliyah." We have to set ourselves free from that 6th century mind-set and come in this fast changing jet-set, technologically changing world. Globally we are behind everybody...if we have "correct interpretation" of our moral and our character why do you think we have sunk so low.....that everyone is walking over us. This column is dedicated to Imam Dr. Yusuf Zia Kavakci. 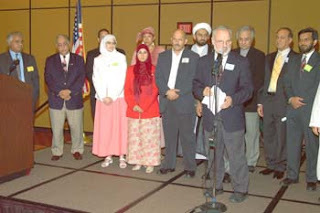 The following two pictures were from the Unityday USA event, which was an inter-faith and intra-faith event. There is only one Islam, but each one of us sees it differently. While there is hardly a disagreement on "many" a key issues, we certainly disagree on some. I dedicate this to our Imam Dr. Yusuf Zia Kavakci, who has encouraged me to do my individual share of work in bringing the ummah together, those words have constantly motivated me and I continue to strive towards that goal. We have to learn to accept that God has created us as unique beings; each one of us has his own different thumb print, his own DNA and his own ID. He did not punch us out like the Farishtas (angels) on his mass production machine, each one of us was made unique; one at a time. Among Muslims of all hues we will get 100% consensus on the subject of Tauheed (Oneness of creation), Muhammad (pbuh) the last Prophet, and several other items that most will agree. However there are areas we differ and perhaps partially agree, such as the format of Hijab, Prayers, women leading the prayers, Public Sharia (deals when more than one person is in the equation), divorce, conversions and a few other issues, we have the God given right to have a different perspective. No one should even dream of compelling anyone to conformity, it simply goes against the human Fitra (nature). God loves his creation and shares his wisdom with us in Qur’aan that there is no compulsion in matters of faith. Over the centuries we have learned to accept different perceptions of the same "fact" as to what prophet said in his last sermon. While the Shia believe that the prophet assigned the role of leadership to his family members, the Sunnis believe that no one was assigned to lead them and their version is “I am leaving the book to you to read and understand” whereas the Shia version adds the progeny to the book. How does that matter, when both agree that on the day of judgmeent ( or reflection in solitutude) it is what we do to others, how we treat others that matters. Among Shia’s we differ and hence we have the Shia, Bohra, Ismaili and a few more classifications. Among the Sunnis we have the progressives, moderate, Barelavis, the Deobandis, the Nahadtul ulamas, the Wahhabis, Salafis etc, and within each we have several others like Ahle Sunnat, Sufis, Kurds, and a few more. Then we also have the Ahmadiyya and Warith Deen Muhammad Branches. Each group is claiming to be rightly guided by the Quraan. Please note that I am using the language of "we" , a few comments rolled in and said that they thought I was Shia, and few that I was a Sunni, which is Ok, but do you think Prophet Muhammad would recognize these labels? He will not, however, he knew that there will be differences and made it easy for us - by acknowledging with a metaphoreic number of 72, meaning there will be a large number of divisions. Quraan is bold about it when it says, we have created you into different nations, tribes and communities, then adds, so that you may learn to know each other to figure out creating a conflictless world,which is usually referred to as Kingdom of Heaven, a Christian term which translates into Tauheed (oneness) in one sense. Who is really right then? Should the large numbers among Sunnis give them the right to be right? Didn’t prophet have only two people supporting his mission for a while? Did their numbers make them wrong? Does Shia’s claim to the family of Prophet make them right? Guess what, all of us are right, we have to have the humility in us to respect other point of view. No one has to be wrong for us to be right; it is a difficult thought for those binary people who see things in black and white, it is like pulling the earth from beneath them, they feel threatened to even consider the idea that all of us could be right, some how they are conditioned to believe some one has to be wrong for them to be right. We have to get out of the mode of seeing others from our limited point of view without giving them the same right. The differences are legitimate and we must accept them instead of fighting who is right, only Allah will decide that, not now, but on that elusive Day of Judgment. Indeed, we differ on some issued but not all, and we must be cognizant of this. We need to fight the temptation that acknowledging other Muslims's tradition as good as ours, will somehow diminish our own tradition, it does not. When God calls on us on the Day of Judgment, it is our deeds that matter. In Islam, the idea of Munkir- Nakir, the angels (your own conscience) who register your bad and good karma exists; signifying the freedom one has to pile up either side and live with its consequences in terms of anguish (Hell fire) and serenity (Jannah). A good deed is your clear responsibility to the creation; life and matter. Our Unity should be based on the Shahada (Pledge) to bring justness and peace to the world at large, also referred as Aalameen. We are Muslims, the peace makers, and when we band together, it is to do “good” and not to be against some one, such unions are false and won’t last. What you do with your Deen is your responsibility as what I do is mine. Neither of us is answerable to any one but God. Islam is large enough to accommodate all our differences. The Neocons of all faiths (http://hatesermons.blogspot.com/2008/03/neocons.html ) have successfully created hostility between Iran and Saudi Arabia, between Hamas and Fatah, between Shia’s and Sunnis and between us. Do we need to blame them? Absolutely not, we need to understand our own dumbness in allowing others to place wedges between us. It is time for us to wake up and join in with our differences to repair the world. God has given us this opportunity to be the peace makers of the world, first let’s have peace between us and extend that to the world. The differences are God given” so is the “free will” and as an individual I am committed to peace within and peace for all, that is what Islam means. God guides me to know each other, so together we can create a kingdom of peace for all the seven billion of us. I would resist all temptations to mis-represent the otherness of other traditions. No matter what any one tries to get me to say negatively about Sunni or Shia, Ismaili or Bohra, Ahmadi or Wahhabi or any faith for that matter. I will refrain from talking ill about others (applies to all faiths and traditions) and present them not to make them look bad or make mine look better, but for people to know what is that they believe without classing them. No matter where I go, I want people to see me as a peace maker, some one who is bent on mitigating conflicts and nurturing goodwill. I don’t want people to be afraid of a Muslim or his beard or her Hijab, instead they should say OMG, here comes a Muslim, a peace maker, the truthful, the trustworthy and the Amin.” Amen! It will take ten years to change the world around us. Would you do your share? We can take this message to the world, each one of us have to do our part. Dedicated to Dr. Imam Yusuf Kavakci. The following two pictures were from the Unityday USA event, which was an inter-faith and intra-faith event. Written and sent to Dr. Kavakci on 2/4/2010 1:20:58 A.M. Central Daylight Time and he responded back, that efforts will take time. All divisions are motivated by "me, me and my way". usually differences are political in the sense "my understandiang is the right one". they find safety in a environmnet that subscribes to their ideas. The easiest thing for me was not to write about this topic at all; some responses are belligerent and some are naïve; the first thing that came to my mind was the Fox News and the Christian Neocons, who incessantly itch to hate someone with vengeance, Muslims at this time conveniently fill that vacuum for them. It was interesting to observe that Muslim Neocons also have the same need to fill that hate vacuum and the Ahmadiyya Muslims fill right in for them. Some wise man said, no one will criticize you, if you are dead. It is politically expedient to go along, that is precisely the problem in the world today. I’d rather speak up and speak out and take some crap instead of letting things go. The need for us, intra-faith and interfaith is to step up the work for creating a better world to live; an inclusive world is the right formula at the end of the day. I am pleased to share a few interfaith moments about Imam Dr. Yusuf Zia Kavakci, a scholar of Islam, a lawyer and an Imam. He has now established an institution with his name to impart education to the youth born and raised here in the D/FW Metroplex. Tonight, April 10, 2010, he is being honored for the international recognition he has brought to the Dallas Forth worth Metroplex. He is listed among the 500 influential Muslims around the world. 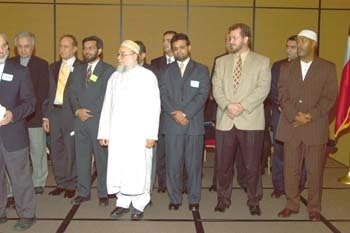 When we initiated the Unity Day program in 2005, a 9/11 memorial event to bring Americans of all hues together to rededicate our pledge for the safety and prosperity of our nation, I ran into a conflict, one of my volunteers wanted additional time be given to Muslims in the interfaith prayer sequence of 10 religions, a suggestion was even made, that since it is a Muslim initiative, they should have the floor first. However, as a Muslim deeply committed to the pluralistic values of Islam, I strongly believed in the egalitarian values embedded in every aspect of Islam including the rituals, and I was having difficulty with the idea of being treated special. 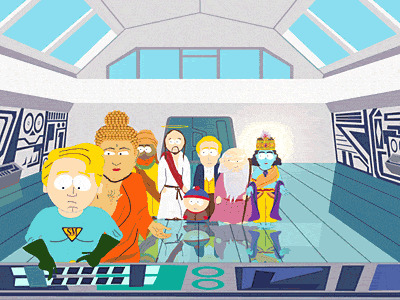 I wanted every one of the ten religions be given equal time, and to avoid conflict of priority, we put them in an alphabetical order. A few of the volunteers were making it difficult for me for not listening to them. “Brother Mike, Religiously you are right, that is the right thing to do, we have to believe and practice equality, but if you want their support, you decide what you want to do, but do the right thing." That was exactly what I wanted to hear and I asked him if I could put those words, " Islamically it was right to treat all faiths on par" that in the email and send it to the group, he said go for it, and with that conflicts faded and solutions emerged. I cherish that moment with Dr. Kavakci. In another personal incident about 15 years ago, when I was marrying my late wife Najma, I wanted my friends Mr. Maini and Mr. Sharma, who are Hindu by faith, to be the required witnesses of the wedding ceremony as I considered them my elder and brother, but the tradition was for the Father, Uncles or brothers to be the witness, generally Muslim, in my case they were the ones for me. So, Imam Yusuf, Najma and I went for a walk in Dr. Asif Syed’s ranch and being an out of box thinker he was, he suggested that we increase the number of witnesses to five and include two of my friends with the other three. I adored him for that and have been admiring him since then. Last year at the SMU, the students hosted a talk on Human rights in Islam, and one of the greatest moments of my life came upon me when I found out, I was the co-speaker with Dr. Kavakci, what an honor! A humble man by nature, he wanted me to sit right next to him during the Q& A session, and goaded me to answer the questions first, I found an unusual safety in it, after my response to the students, he would start saying perfect and then quote Qur’aan to support my response. He made my day. Imam Yusuf calls himself a Khaksaar, a humble soul and a person who serves the humanity. I recall my Grand father also used the same title with his signature in his correspondence with Allama Mashriqi. Imam Yusuf has been on my Radio show several times, one of them was a daily show called the Wisdom of Religion, all the beautiful religions and the other was a Saturday program called Festivals of the world, where we shared the essence of every festival you can imagine in that given week. He and I have shared many delightful moments on the radio. He is an amazing orator. I have always enjoyed walking into his office and hear him say that, I am one of the Muslims he can speak without guards. He also gives me immense value in saying that I could bring the communities (intra and inter) together. I am proud of that. A few months ago, I wrote an article about intra faith and dedicated that to him. Today, I have reserved a table with great enthusiasm and labeled it “Islam intra-faith table” and have invited two Muslims each from Ahmadiyya, Bohra, Ismaili, Shia, Sunni and Warith Deen Muhammad traditions to start a conversation. I am delighted to see this great scholar, Imam Dr. Yusuf Zia Kavakci has been recognized as one of the 500 influential leaders in the world.